Mangaluru, Mar 19, 2018: Congress President will arrive at the Mangaluru International Airport at 11.30 am on March 20, Tuesday and will proceed to Kaup by a chopper for the inauguration of Rajeev Gandhi Political Institute at Tenka Ermal. Following a road show at Padubidri, Mulki and Suratkal he will arrive at Jyothi Circle. Later, a public meet will be held at Nehru Maidan at 6 pm. Soon after the meet, Rahul is scheduled to visit the Kudroli Shree Gokarnanatha Temple, Ullal Darga and Rosario Cathedral. 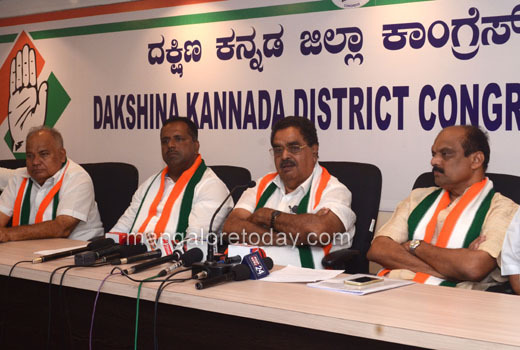 Informing this to reporters here, District in-charge Minister Ramanatha Rai said on March 21, Rahul will address Block Congress Chiefs of Dakshina Kannada and Udupi and will leave for Sringeri at 11 am where he will visit the Shringeri Sharada shrine and meet the seers. Later, he will speak to students of Rajeev Gandhi Sanskrit University and inaugurate the new Block Congress Office.